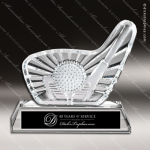 A Sculpted Glass Award Depicting a Golf Club Head and Ball on matching Base. Personalized with the message of your choice, it will surely become a treasured keepsake for the recipient. Imagine the expression of the person when they see their name on one of these impressive awards. 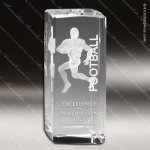 Engraving is laser etched and a velvet lined presentation gift box is included. 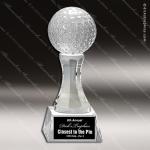 An Elegant Tall Crystal Golf Award with Tall Crystal Base. Personalized with the message of your choice, it will surely become a treasured keepsake for the recipient. Imagine the expression of the person when they see their name on one of these impressive awards. Engraving is laser etched and a velvet lined presentation gift box is included. 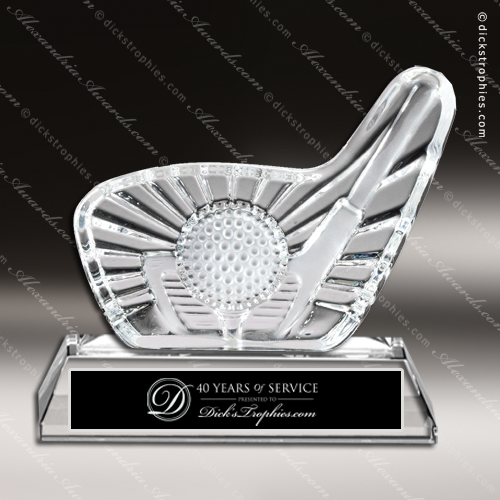 An Elegant Crystal Desk Award with Actual Size Dimpled Golf Ball. Personalized with the message of your choice, it will surely become a treasured keepsake for the recipient. Imagine the expression of the person when they see their name on one of these impressive awards. 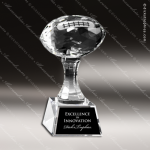 Engraving is laser etched and a velvet lined presentation gift box is included. A Stunning 3-D Golfer Inside a Crystal Pedestal with Fully Dimpled Golf Ball on Clear Crystal Base. Personalized with the message of your choice, it will surely become a treasured keepsake for the recipient. Imagine the expression of the person when they see their name on one of these impressive awards. Engraving is laser etched and a velvet lined presentation gift box is included. A Clear Crystal Golf Award on Sculpted Prism Pedestal and Clear Crustal Base. Personalized with the message of your choice, it will surely become a treasured keepsake for the recipient. Imagine the expression of the person when they see their name on one of these impressive awards. Engraving is laser etched and a velvet lined presentation gift box is included. 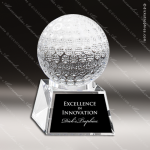 An Elegant Crystal Dimpled Golf Ball mounted on Clear Crystal Base. Personalized with the message of your choice, it will surely become a treasured keepsake for the recipient. Imagine the expression of the person when they see their name on one of these impressive awards. 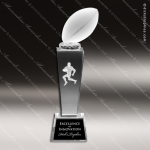 Engraving is laser etched and a velvet lined presentation gift box is included. 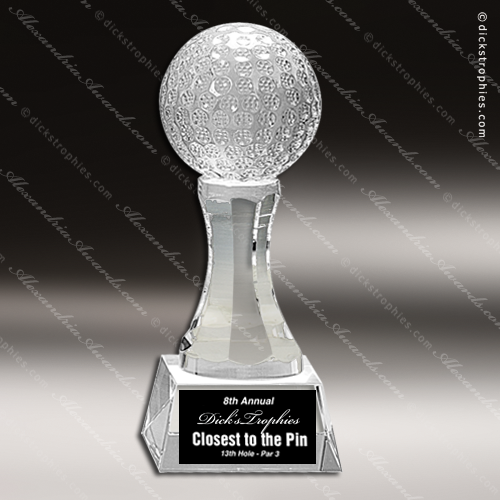 An Elegant Tall Crystal Award with 3-D Fully Dimpled Golf Ball. Personalized with the message of your choice, it will surely become a treasured keepsake for the recipient. Imagine the expression of the person when they see their name on one of these impressive awards. Engraving is laser etched and a velvet lined presentation gift box is included.